The three of us just got back from a lovely long weekend in Las Vegas visiting family. 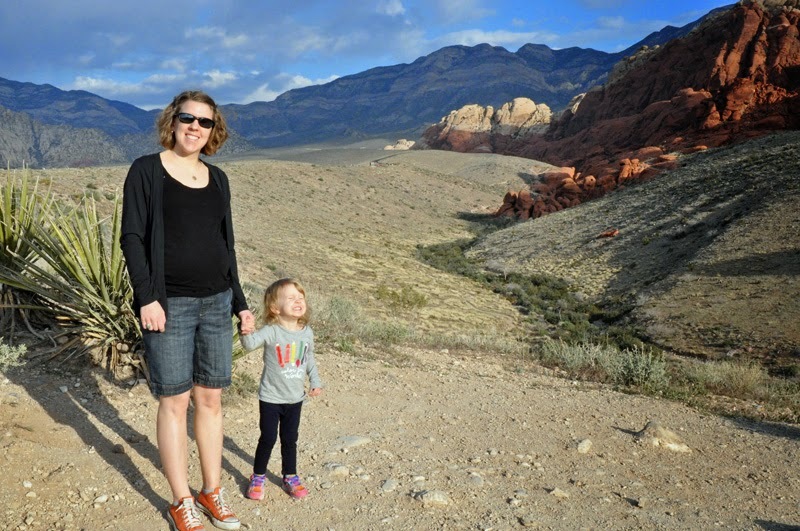 Las Vegas may not seem like an ideal family vacation spot with a toddler and pregnant mama, but I beg to differ! 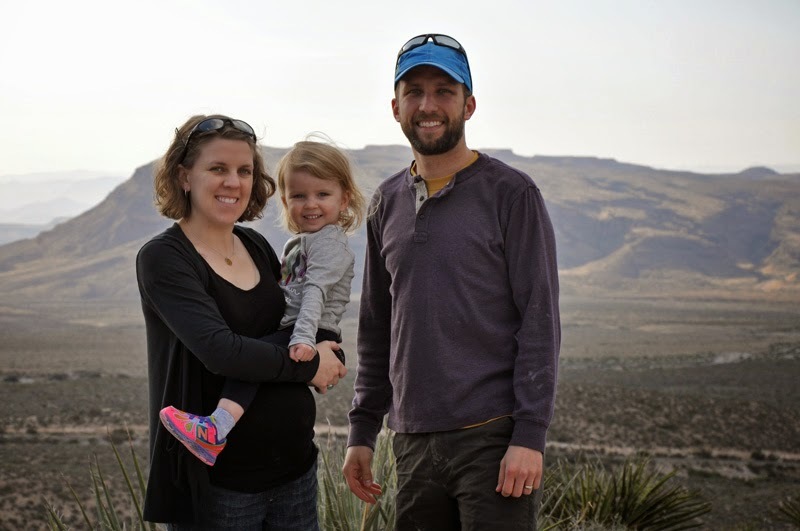 Reason #1 Las Vegas is great for family trips: direct flights and reasonable flights. The 2.5 – 3 hour long flight is bearable and so much easier with no connecting airport battles. 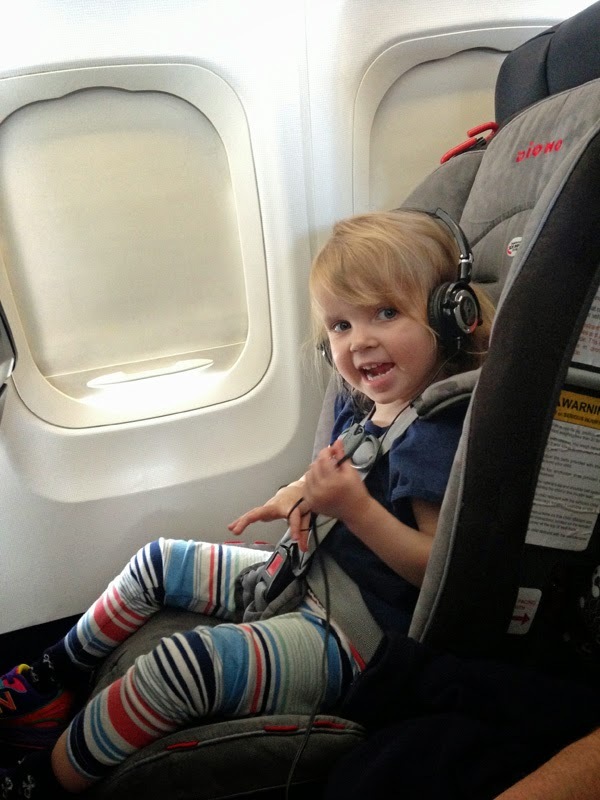 Greta didn’t sleep a wink on either flight, as she was too excited to have a window seat. Here she is rocking out to her favorite kid songs. Reason #2 Las Vegas is great for family trips: plenty of hotel accommodations to choose from. 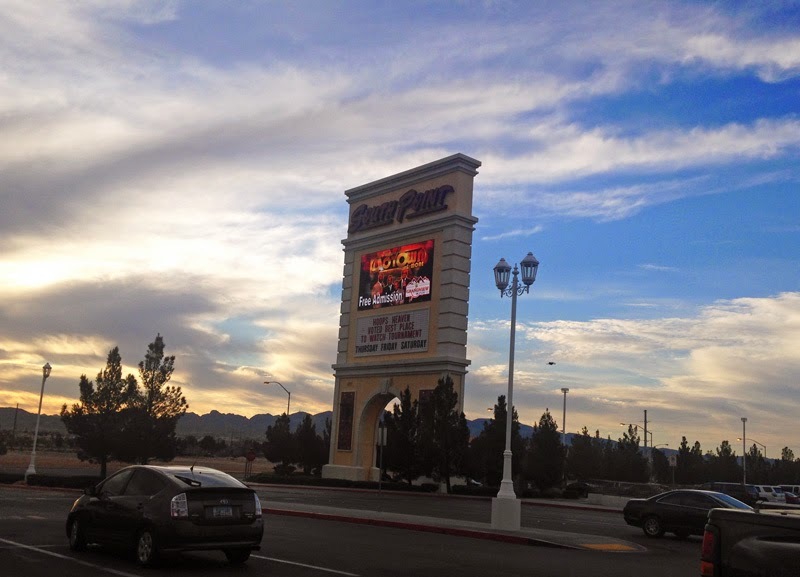 We stayed at South Point, due to its proximity to where our family lives. It was a large hotel with plenty of restaurant options, a large March Madness viewing area, bowling lanes, a movie theater, arcade center, casino on the first floor, Seattle’s coffee shop, ice cream shop, pool, spa, and more. How did Greta react to the casino? See her stare at the graphics below. A downside to our hotel was, that the casino was very smoky and was our exit to the car. We did discover that some casinos have much nicer ventilation systems and so the smoke isn’t even noticeable. 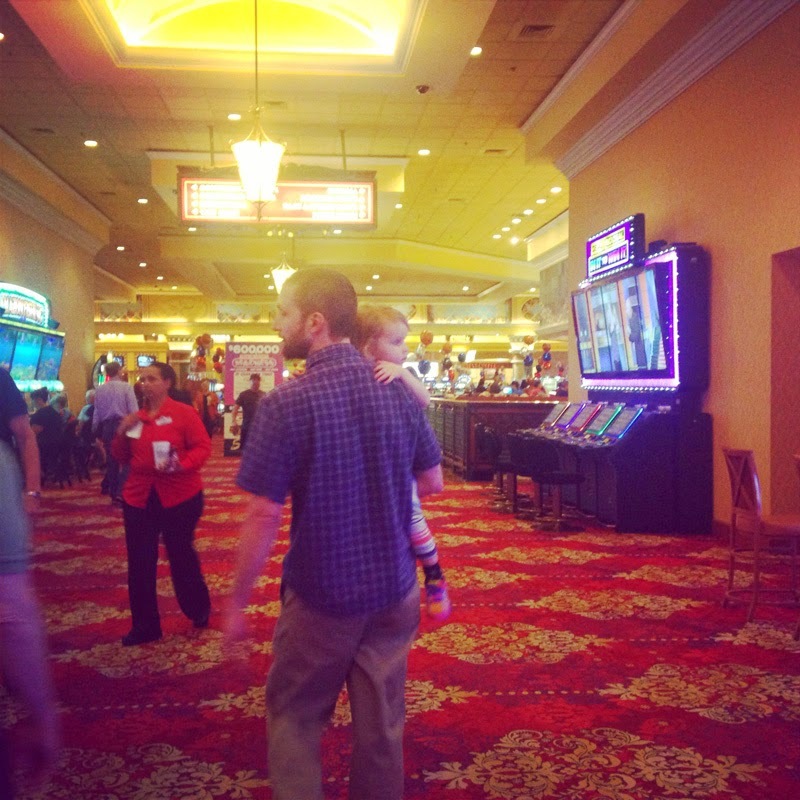 A plus to our hotel – the casino didn’t have girls dancing at the tables like some casinos do. There were a few scantily clad cocktail waitresses, but we managed to avoid them and hence avoid questions. Reason #3 Las Vegas is great for family trips: plenty of free attractions. 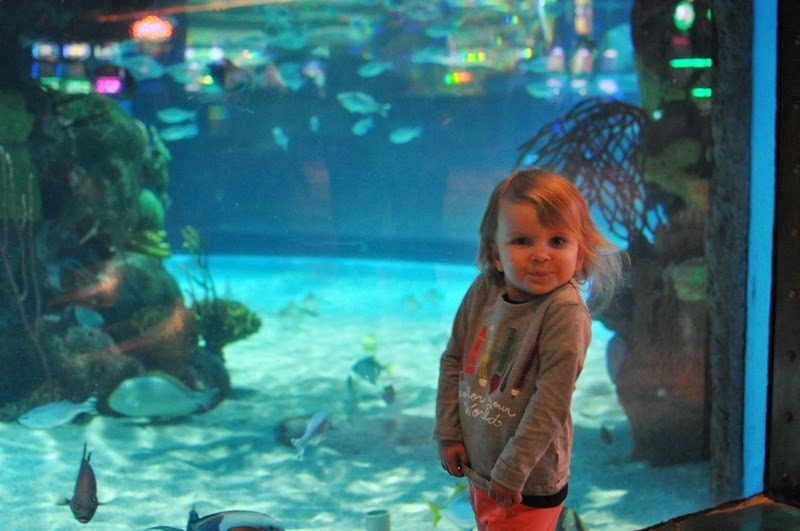 This is Greta visiting the Silverton Casino aquarium. This casino is connected to a Bass Pro Shop, which meant Great oohing and aahing over the taxidermy animals as well. We consulted a few lists online as far as things to do with kids and found this list, Attractions for Kids from vegas.com, to be almost too extensive, as we knew not all of these attractions were toddler-friendly. The Silverton had two tanks – a larger salt water tank (the first image) and a smaller fresh water tank. 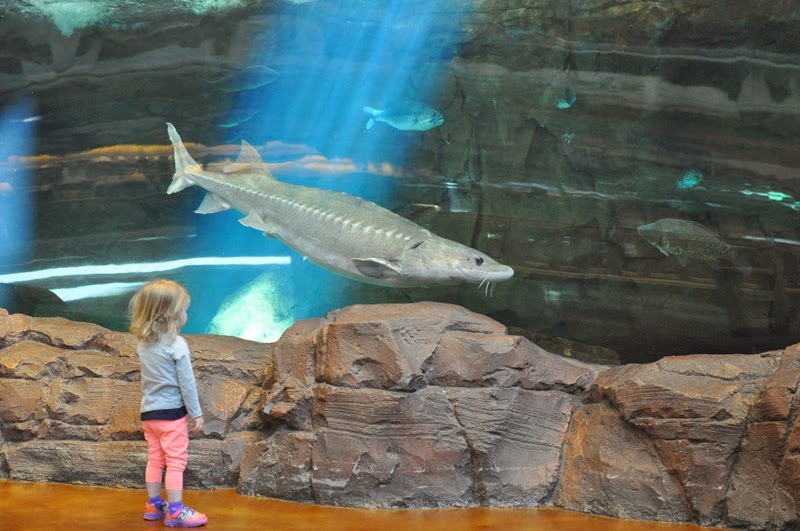 This is Greta in front of the fresh water tank, in front of a large sturgeon. After a morning of aquarium viewing, we headed back to the hotel for nap time. Las Vegas hotel rooms are so quiet – we never heard any loud rowdiness during our entire trip. 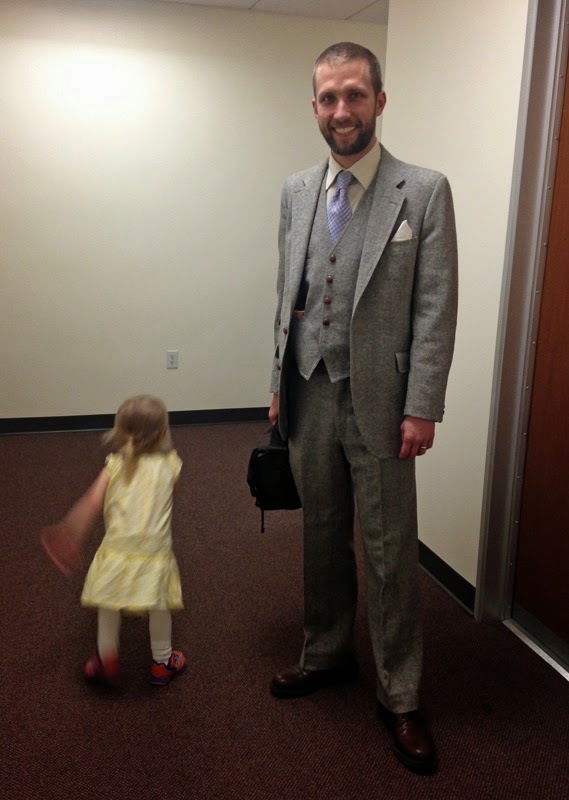 After nap time, we headed downtown to the courthouse to take family photos with Eric’s uncle, the newly appointed judge and to watch the ceremony for receiving his robe. 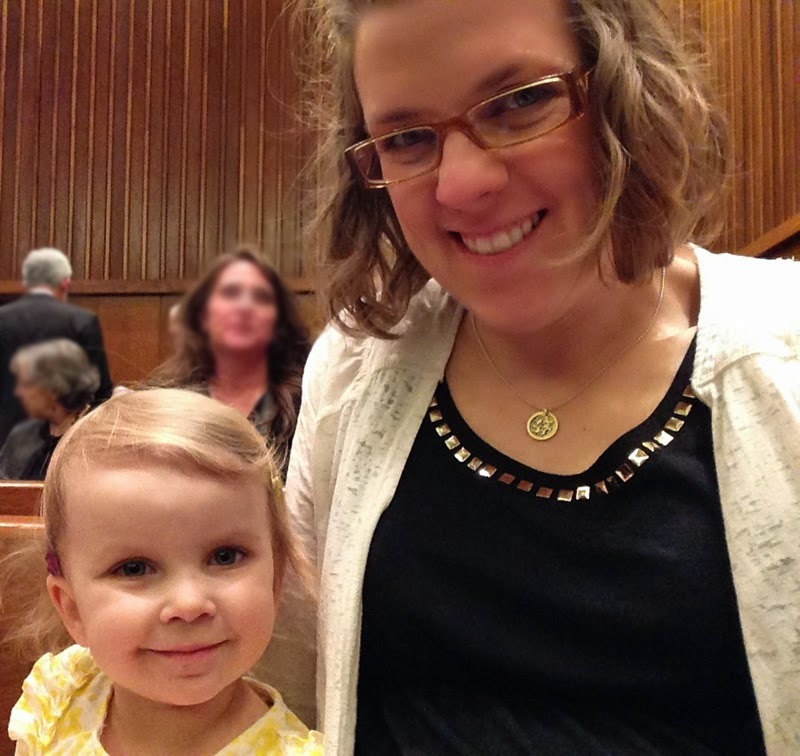 Greta was wound up before the ceremony, but actually remained quiet for the entire two hours that the ceremony lasted! I ended up giving her a pen, my rings, and my wallet to dismantle in order for this to happen. After the ceremony, we attended a reception with delicious food, drinks, and a chocolate fountain for dessert. 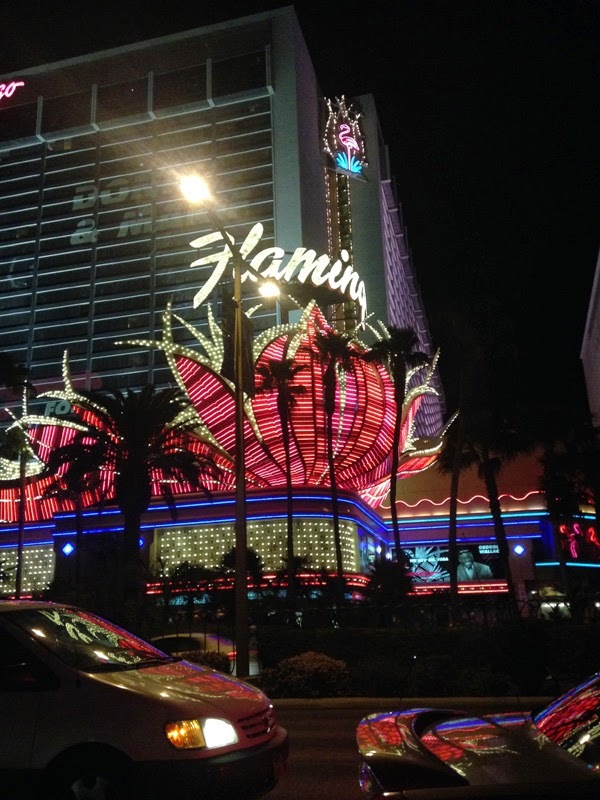 It was late, but we made a drive down the strip for the fun of it. Reason #4 Las Vegas is great for family trips: you can avoid the strip, or just drive through for the fun of looking at lights. Driving along the strip at night means avoiding the fliers for clubs, characters dressed and looking for $15 photos, and drunk throngs. Greta enjoyed the lights and buildings almost as much as the aquariums. Next time, we will make sure she gets to see the Bellagio fountain though, though I will most likely still enjoy it more than she will. 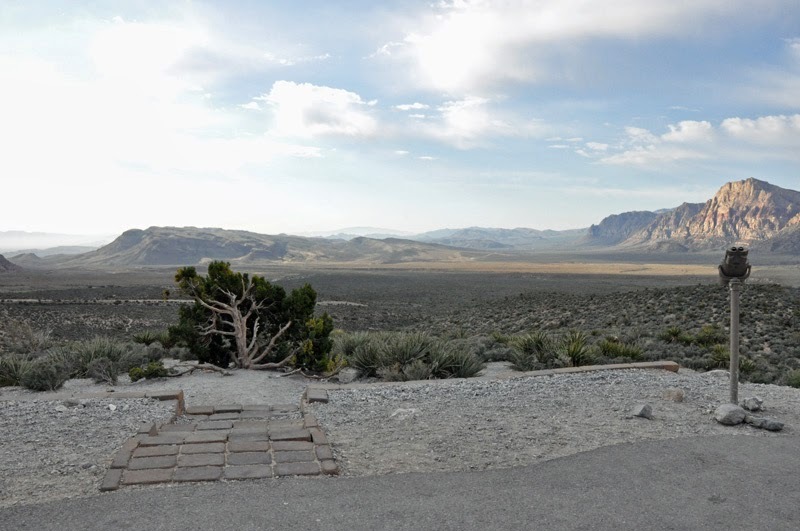 Reason #4 Las Vegas is great for family trips: plenty of things to do outside! Most people don’t think beyond the strip when it comes to Las Vegas. 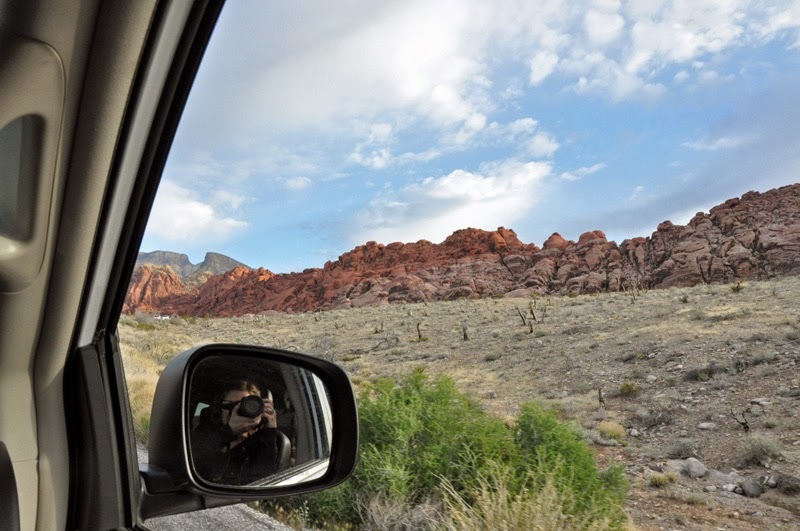 This is a shot out the window at Red Rock Canyon National Conservation Area, just 17 miles outside of the Vegas strip. Normally it costs $7 for a single vehicle to enter the area, though there are some free dates. Check the website for those. We drove the 13 mile scenic road loop and got out for a short hike and photo ops. Greta enjoyed the views of the rock formations, the sandy trails, and different plant life. This scenic pull-out was one of our favorites. Greta gave us an impromptu dance and we even spotted a hot air balloon off in the distance. We didn’t make it into the visitor center, as we were took much longer walking and photographing than we anticipated. However, I have heard and read that it is well worth the stop. Reason #5 Las Vegas is great for family trips: beautiful spring weather when it is cold and snowing in Iowa. 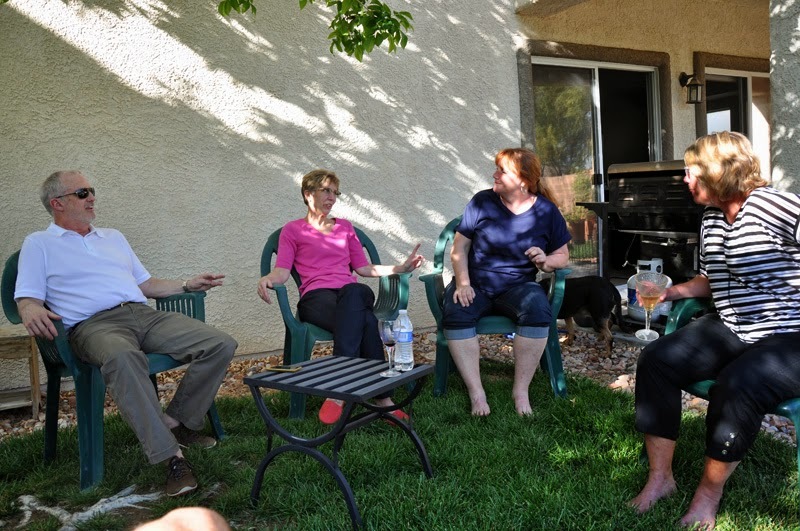 Here we are relaxing in the backyard of Eric’s aunt and uncle. It was lovely to sit in shorts and a tee shirt in the sunny 75 degree weather for a couple days. 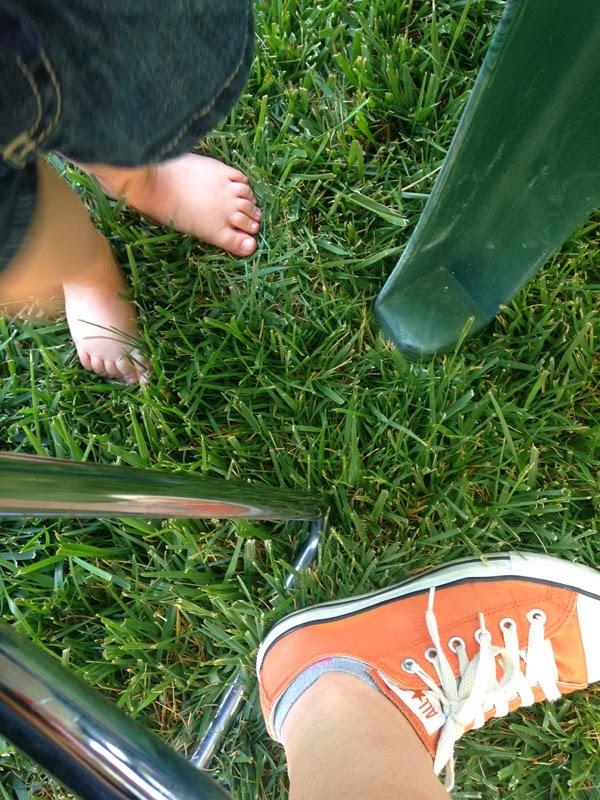 Greta acted like she was getting away with something naughty when I told her she could take off her shoes and socks and go barefoot in the green grass. 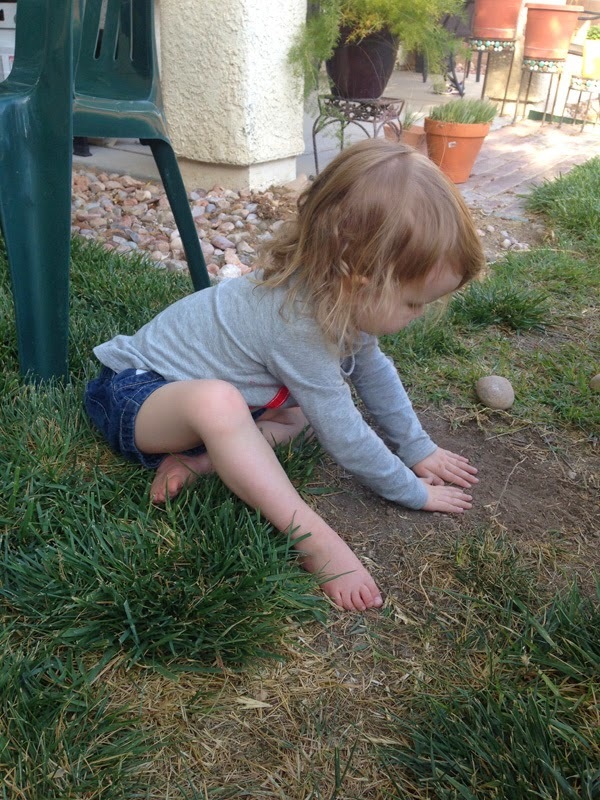 I do believe her favorite part of the trip was our last night, digging in the dirt and making pretend dirt pancakes. This girl and her mother are ready for spring!